What to do when your car needs assistance in the middle of the road? Using an app on your smartphone to find you quick help in those situations is more than necessary. With the right tool you will no longer have to wait under stress for the help to arrive. But, many apps are offered for these purposes but not every one of them is offering you quick and easy assistance when you need it. We did our research and we have one helpful app for you. Let’s talk about it. 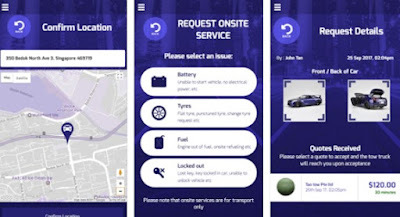 Developed on android and IOS platform, this is an auto and vehicles app which is very easy for using, highly efficient and helpful allowing its users easily and quickly get assistance for their car and tow recovery. Using this practical app, users can find help for their vehicle no matter where they are and when they needed, without spending hours waiting for the help. The app is giving the user the nearest tow operators with only using the user’s GPS, connecting them with the service he needs immediately. The Towber as an practical assistance tool for car and vehicle recovery is helping its users to get fast and easy car or vehicle recovery assistance without much effort, offering them to find for them the nearest recovery service. All the users need to do on this app is to tap to request a recovery of their vehicle and the app is immediately sending a notification with the time of the tow and car recovery arrival. The user’s GPS location is helping the app to find the nearest recovery services and the recovery operators can the use the GPS of the user to locate the exact location where the user’s car is. Not only that, but the app is also offering users a chance to bid for their tow request and get the fairest price for the assistance they needed.